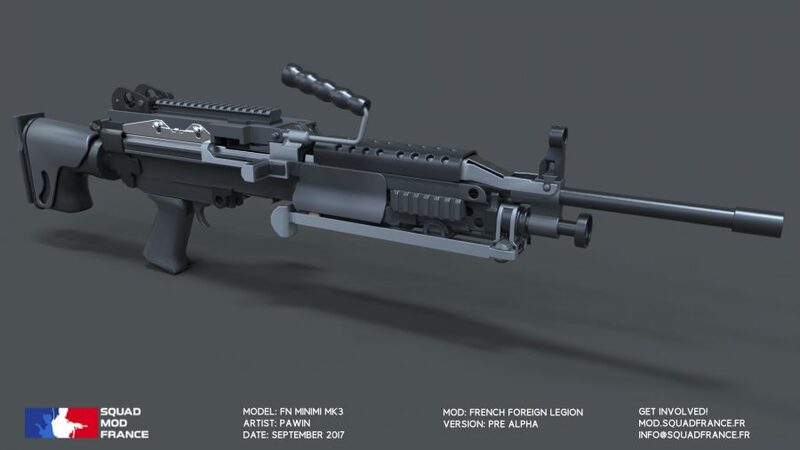 HighPoly render done with zBrush, 3Ds Max and Marvelous Designer. Retopology being done with 3Ds max. 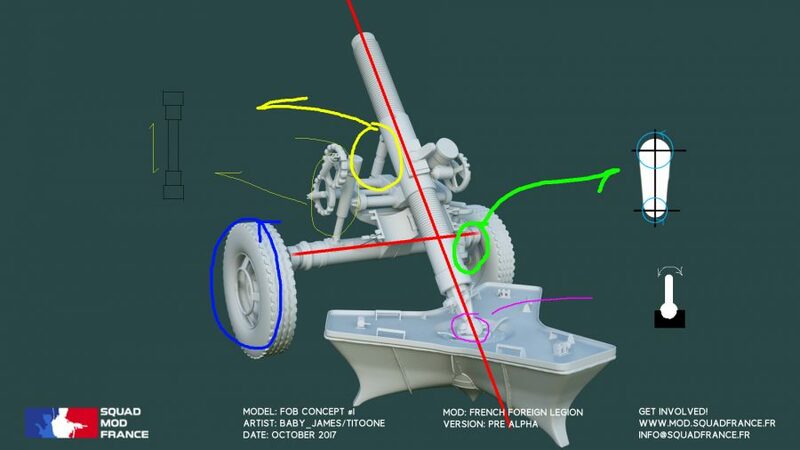 Richard (phoenix) has been working on the AT4-CS lately. 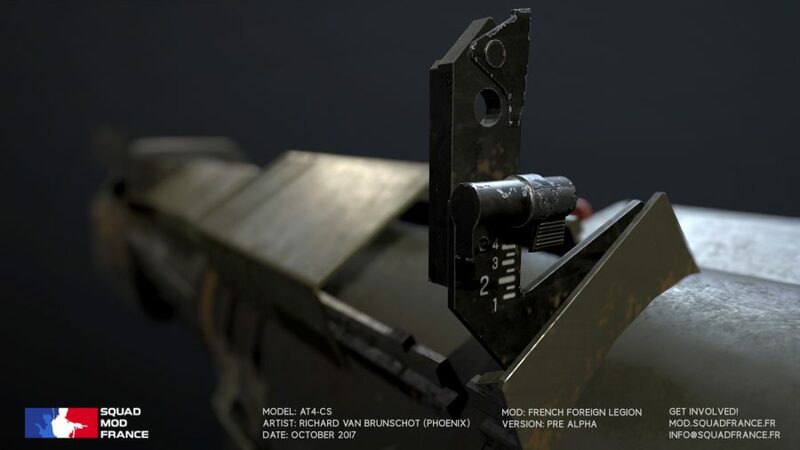 Maya and Substance painter were used to create the asset and the images are rendered in Marmoset Toolbag 3. 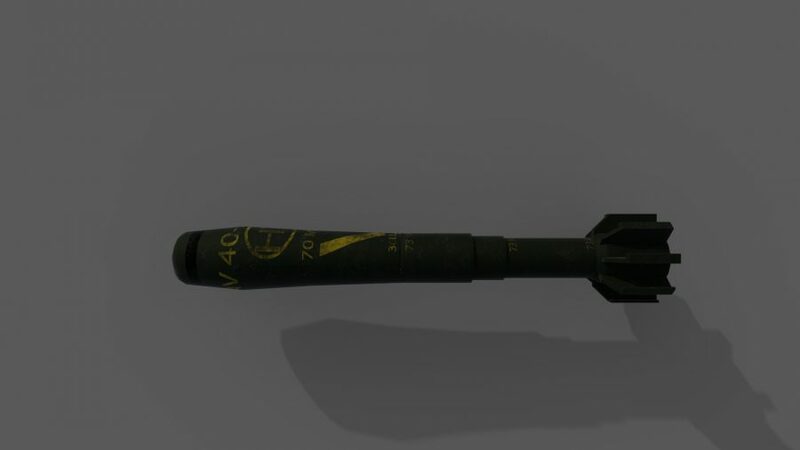 I really enjoy making content for this Squad mod as it makes me a more experienced student of 3D art. 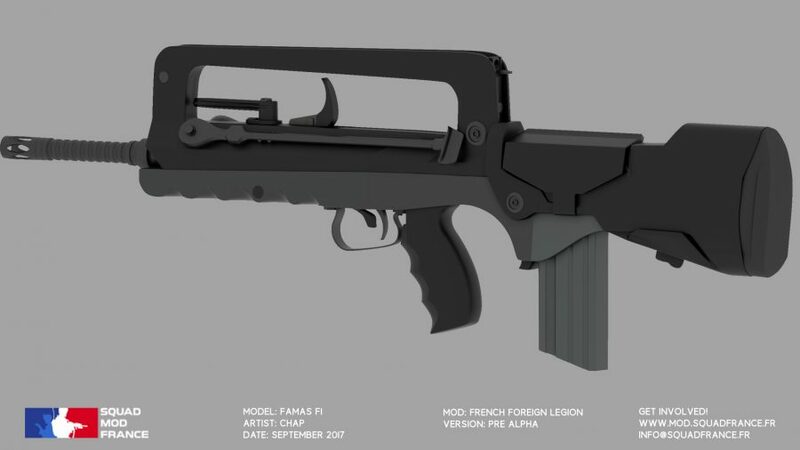 The AT4-CS was a quite challenging model to create as there are so many different reference photos online so I really had to take some time to create the correct version (with help of our Documentalist Lokenn). 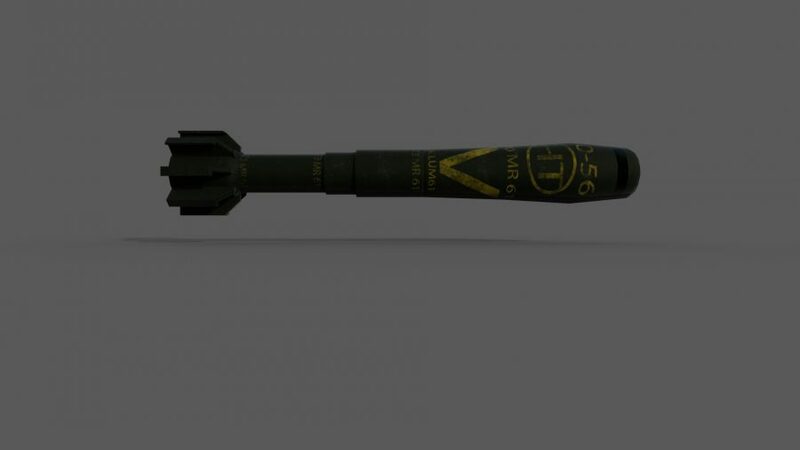 Texasfury is currently working on the implementation in the engine and I hope that you will all enjoy the asset! The Acacias are being modeled in Speedtree and ZBrush. 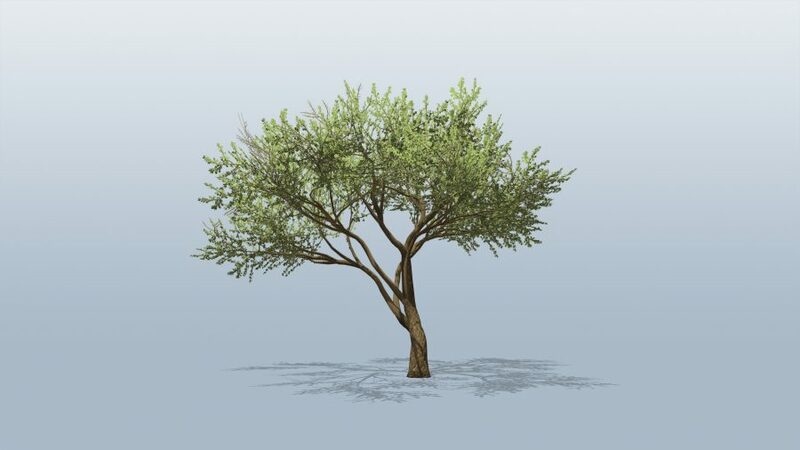 I have several years experience modelling foliage for Unreal Engine 4 and I knew modelling the sparse growth of the Acacia tree would be tricky – too much transparency on a model can really hurt performance! I therefore spent most of my time constructing an optimized set of leaf and branch textures. 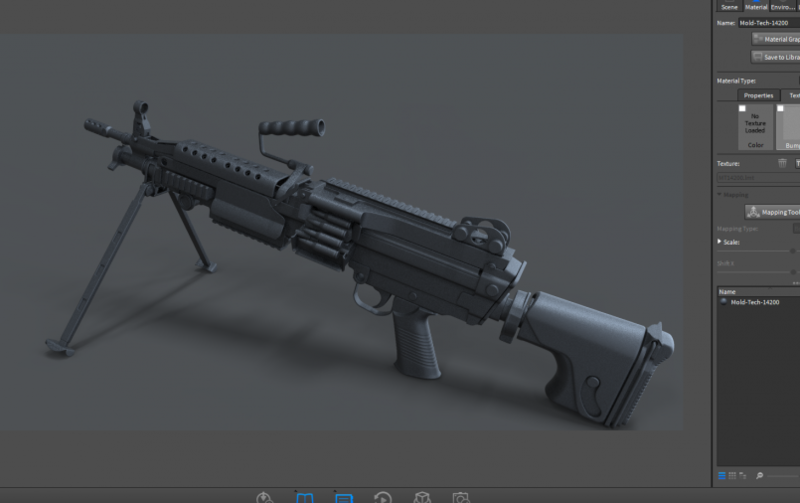 I went through about 20 revisions to achieve something that still results in a believable 3D form. 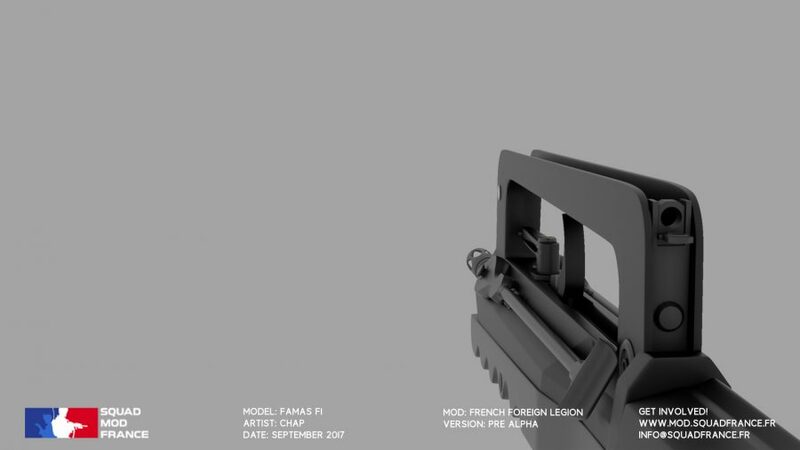 Modeling this Minimi is my first model for Squad French mod. 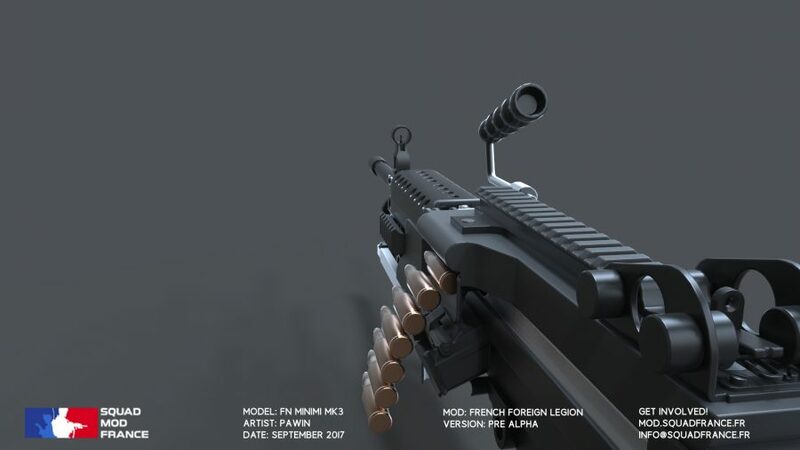 I created this model using 3ds Max. 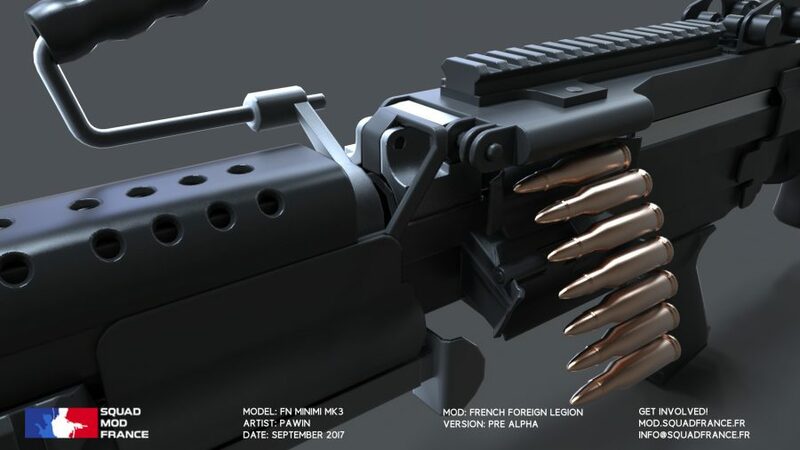 It was quite unique experience and challenging because the gun got lots of components and very complex. 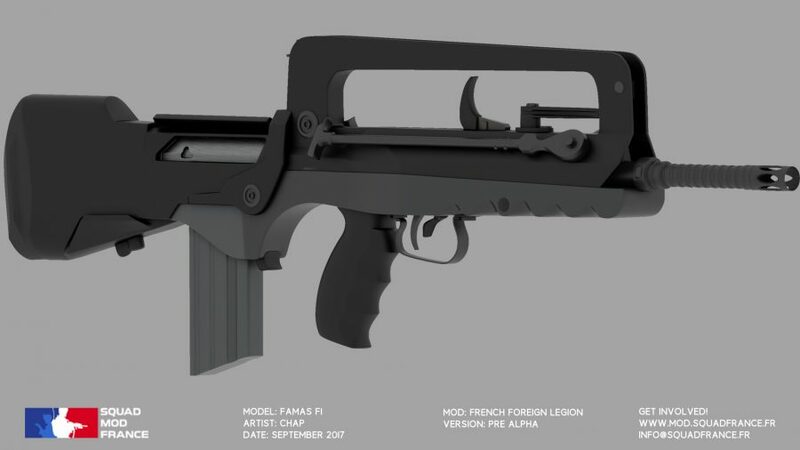 Majority of the inside needed to be modeled because it will be exposed when reloading. 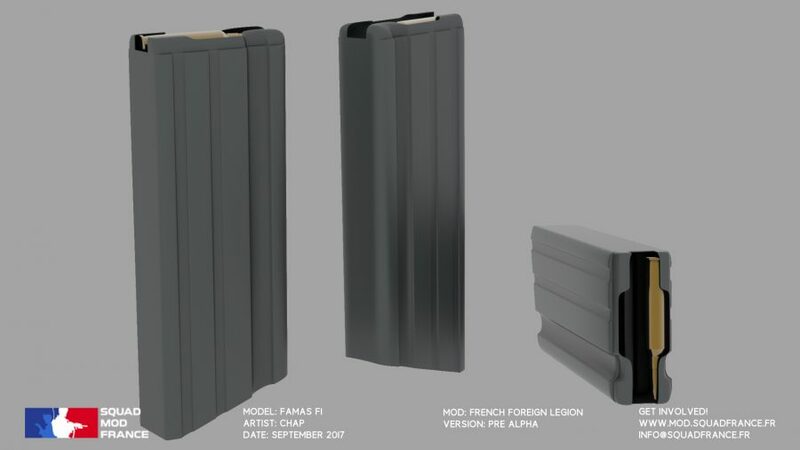 Overall it’s extremely rewarding to have the highpoly done. 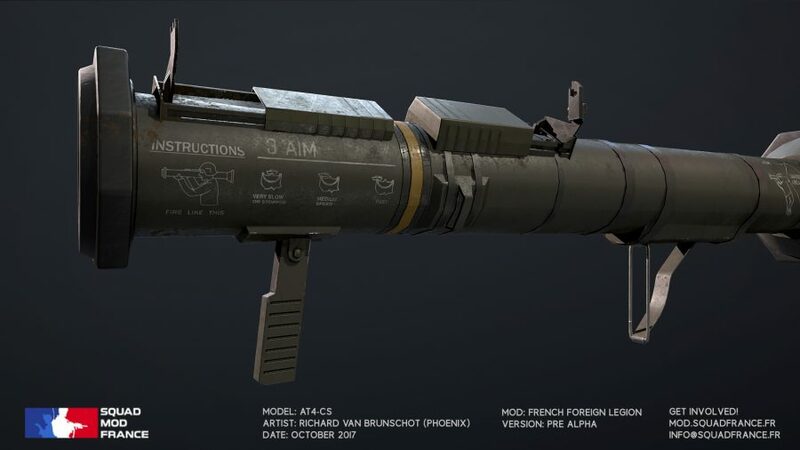 I’m very excited to get the MK3 textures in Substance Painter 2. Hopefully, you all will be excited to see what come next. I would like to thanks all the SMF modder for the supports and special thanks to Skor for inviting me to join Squad Mod France! 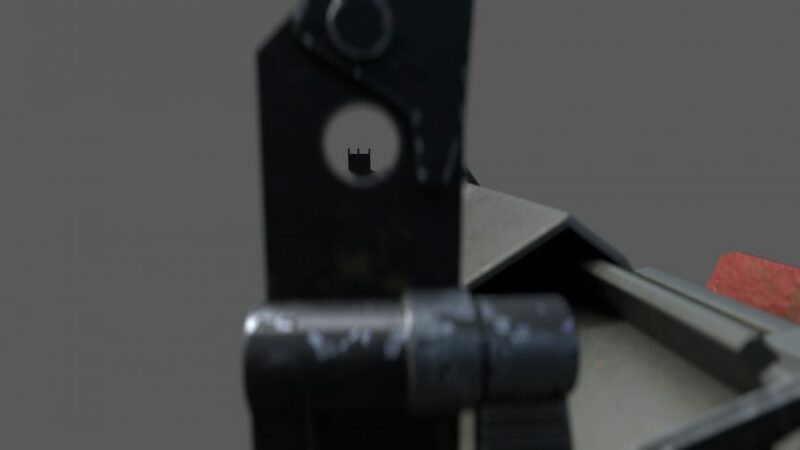 Hello, I’m one of the 3D Artists working for the mod. 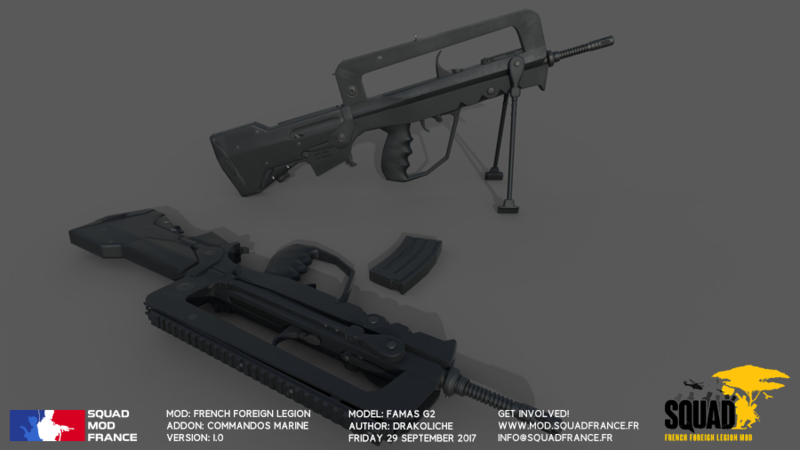 I have been working on the Famas G2 and some of his accessories, for that I used the software Blender for the modeling part of the workflow and Substance Painter for the Texturing part. 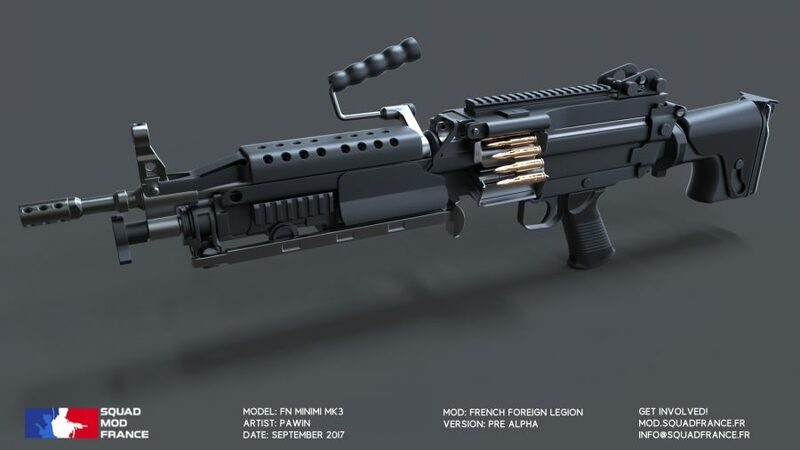 The first thing I needed to do before creating the Famas G2, I needed to understand is interne operation and of course to find some references. 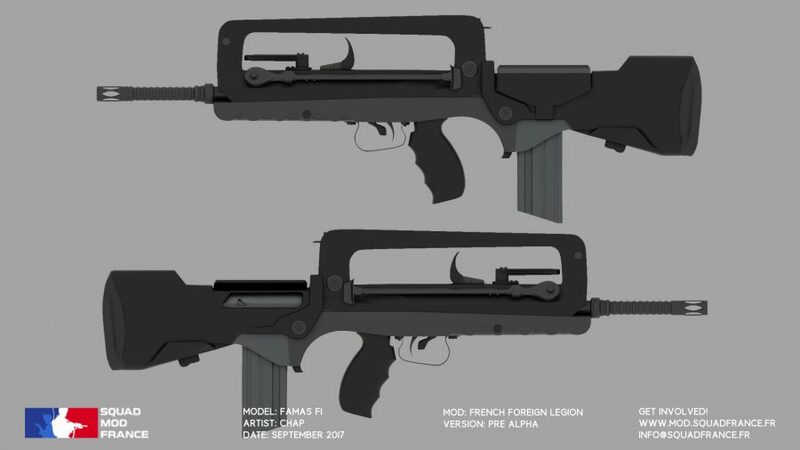 For the modeling part, I’ve make 2 version of the Famas, the first one was the in-game version, the second was the detailed version, this one is useful to have some details we can’t have with the in-game version. 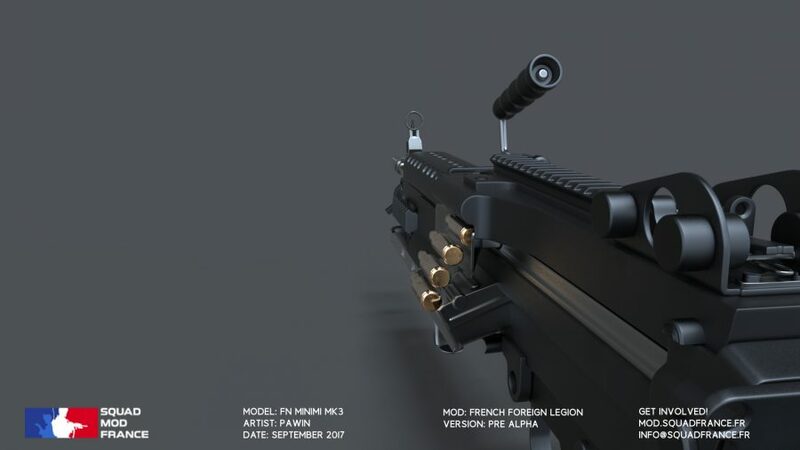 During the Texturing part, I used the in-game version of the Famas, import information of the detailed version to have those on the in-game version of the Famas. 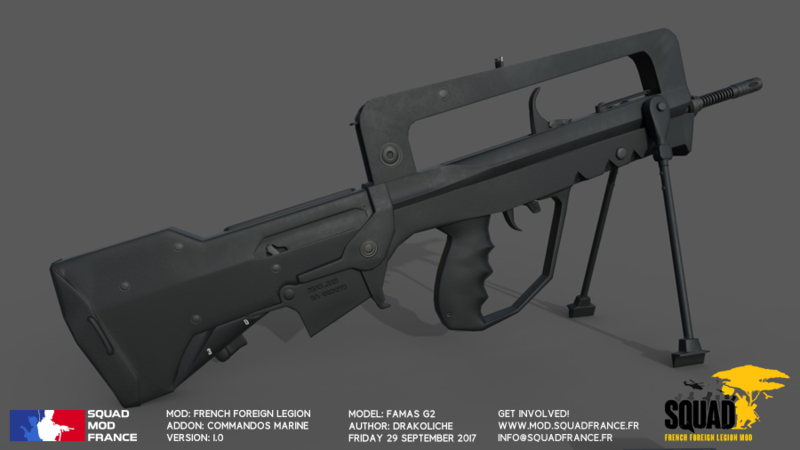 I am just a beginner with this workflow so I had to come back a lot of time on some Famas part for some different reasons (something wrong, something who need more details). 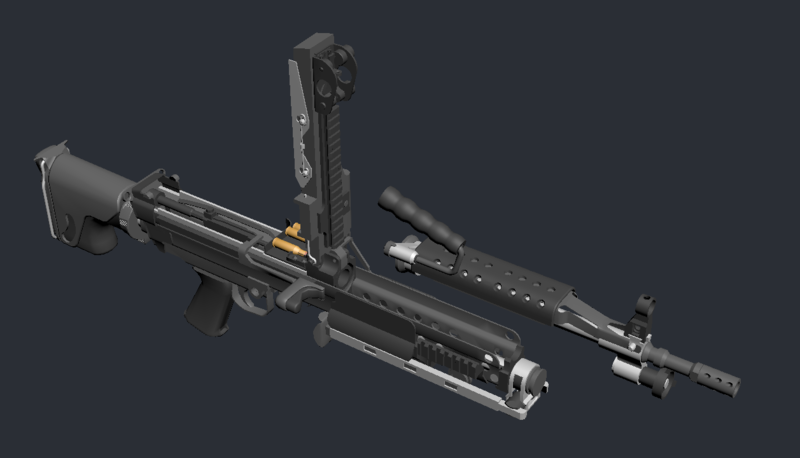 That was fun to do, the Famas G2 is almost finished, just need his accessories and it will be ready to implement in the SDK, I hope you will love it. 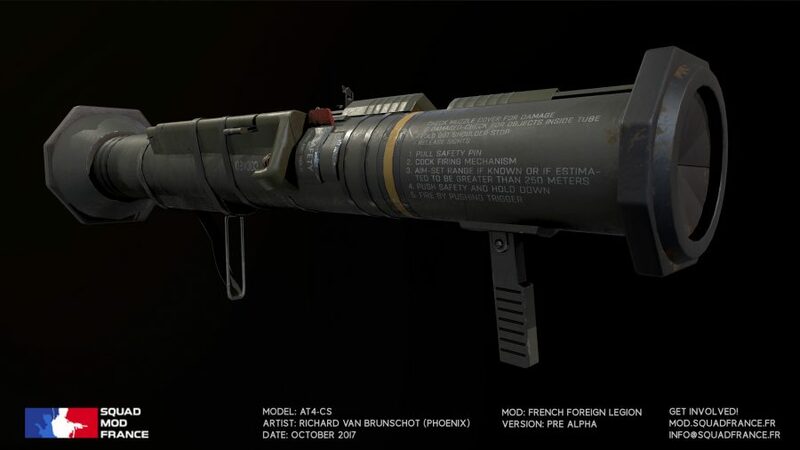 The 120mm mortar is my first game asset I have worked on from start to finish. The whole process started with a broad research and acquiring of the reference photos. 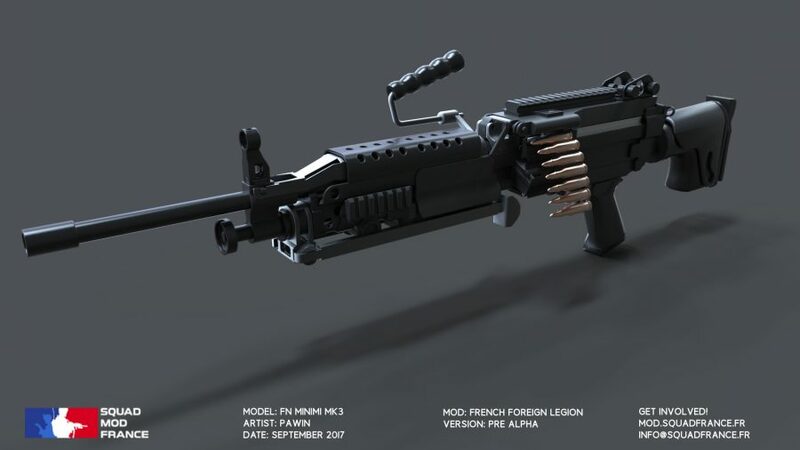 Next step was to dissect the weapon and figure out how it works. Modeling itself wasn’t that demanding for me, but I have decided to go all out on it, so it took me a while to model every rivet and weld on it. 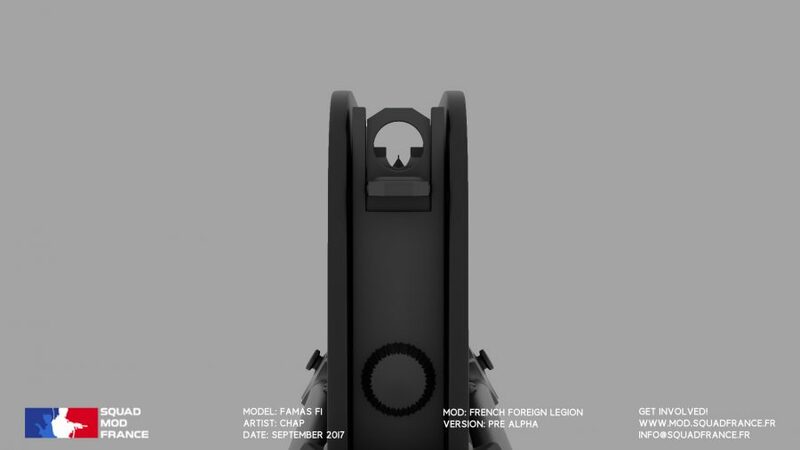 Retopo was fairly fast, since I kept my topology clean from the very beginning. There is still work to be done. Some parts are still missing on the low poly and textures need a bit of tweaking, but should be finished in a week or so. Next step is rigging and then finally animating. 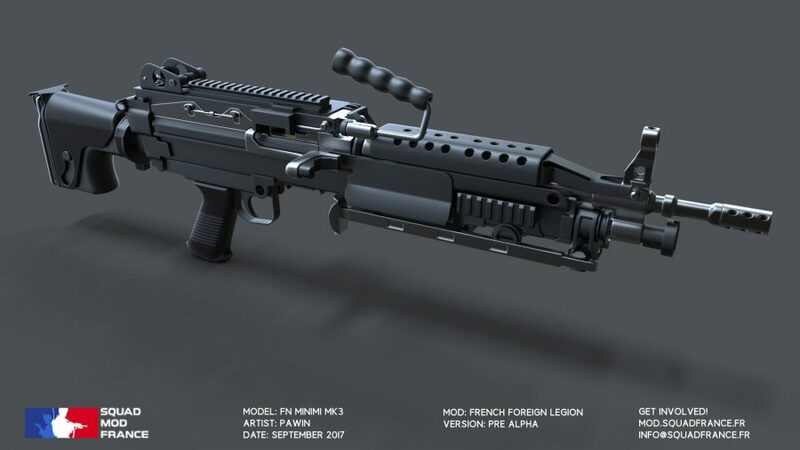 The whole process was done in 3ds max and substance painter. Hopefully you guys will enjoy using it as much as I have enjoyed creating it for you. Although I have worked on various aspects of vehicle audio in personal projects, this is my first experience of vehicle audio in the squad SDK. 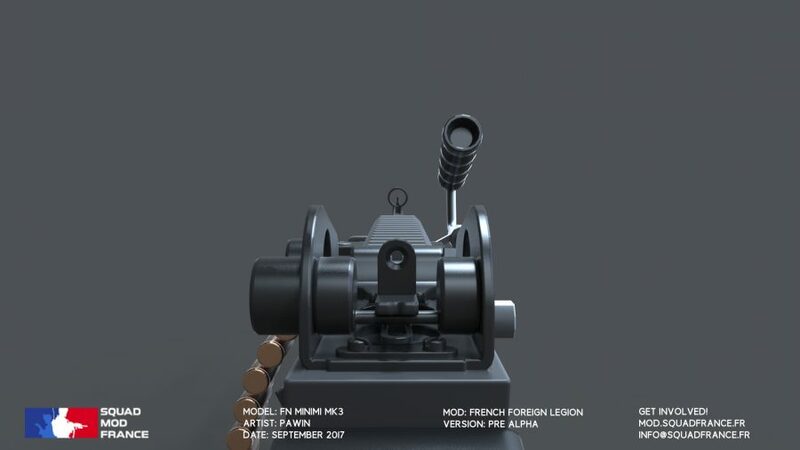 The aim for the foreign legion mod is to have the most realistic and immersive audio experience possible and what these videos showcase are simply placeholders to ensure that our vehicles will work and sound as intended and are NOT representitive of the final product. 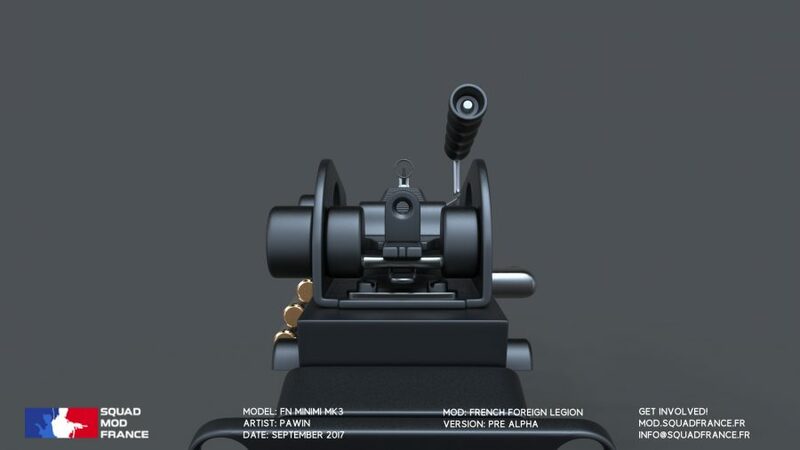 All of the vehicle audio for this mod will be purchased from respectable companies such as Pole Position and SoundHolder in order to fit our standards as well as help to achieve an accurate representation of the different vehicles that will be available in the mod. 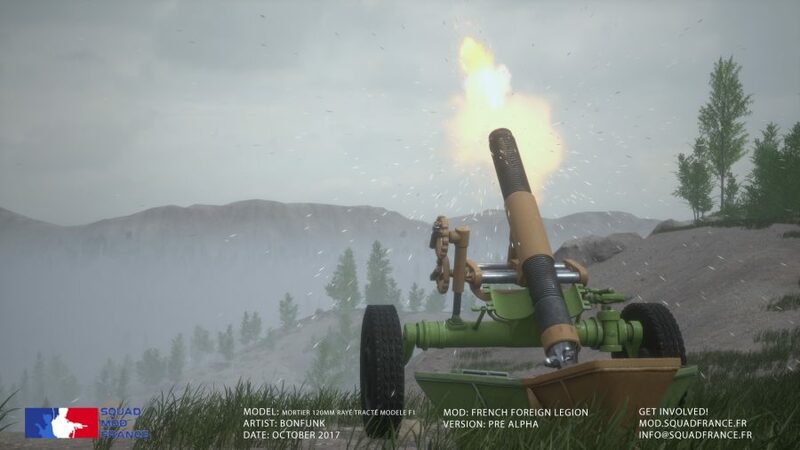 I would like to thank all the members of the Modding Team with a special mention this week to Lokenn who did an amazing job documenting us and providing us advises as Documentalist – and the members of the SquadFrance community for supporting us and making that mod what it is. Our wishes to RebornRock who encountered some difficulties (thank you man being there and keeping up). Thank you also to the Mapping guys, people don’t see the work at the moment but they are working and the map will be great. Amazing work ! Thanks to you all.